Last year’s champion sprinter in Canada, STACKED DECK bossed around his rivals in Friday’s re-scheduled Kennedy Road Stakes – Grade 2 for owner Bruce Lunsford. The son of First Samurai, who was bucking in the saddling enclosure pre-race, won the OJC Stakes in September and was 2nd by a head in the Grade 2 Nearctic Stakes to Calgary Cat. With his 2 for 5 record this year for trainer Barb Minshall, Stacked Deck is in line for another possible championship but he has to get past Calgary Cat and three-time stakes winner Passion for Action. On Friday, Eurico da Silva won 4 of the 10 races and the wagering came in a just over $4 million. SATURDAY, Earle Mack’s FREITAG, a son of Giant Gizmo – Deadlock by Regal Classic, finally won his first stakes race after five stakes placings. 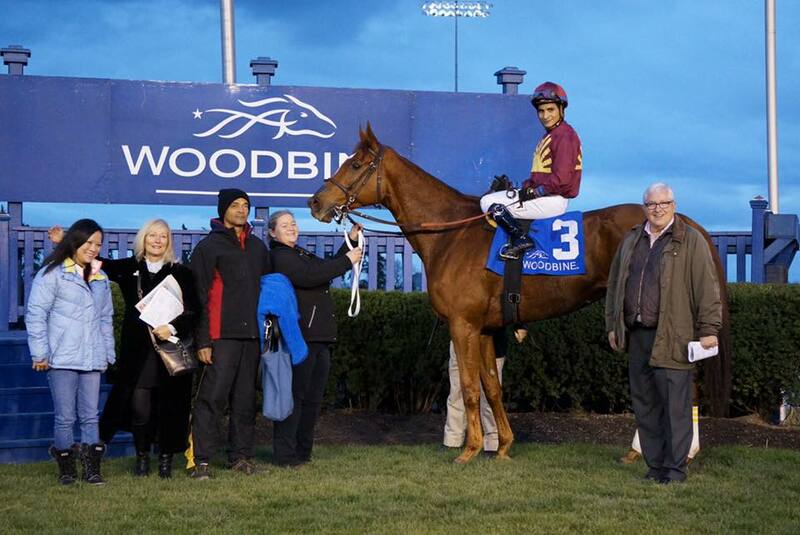 The giant chestnut, also known as Spike, rallied in time to win the Sir Barton Stakes at 1 1/16 miles, setting a track record of 1:42.16. max’smiraclejourney, competing in his first stakes race for trainer Kevin Attard, was second just a head in front of front runner Nevaeh’s Valentine. Freitag earned a 94 Beyer Speed Figure. His 17-year-old dam, Deadlock, who also produced multiple stakes winner Stuck in Traffic, was sold on Saturday evening in a complete dispersal of Helga Reiss’ Clayborn Farms. Alan Garcia rode and all 3 stakes races o the 3 days were won by either Garcia or Rafael Hernandez, both represented by agent Anthony Esposito. More Saturday – Barry Holmes’ GOLDRUSH GLORY, a full sister to stakes calibre Goldstryke Glory, won her maiden in race 1 in her 2nd career race. The 2yo BC-bred by Second in Command is trained by Kelly Callaghan. STARSHIP SABRINA, a 7-year-old mare, won for the 4th time in 2016 when she took a $7,500 claiming event on Sunday for Natural Eight Stakes and Jim Wright. Trained by Bill Tharrenos, the Yes It’s True mare changed barns for the 5th time after the race as she was clamed by Jim Ensom. Starship Sarbina has won 11 of 60 races. SAM’S CROSS, a homebred 2yo for John and Breeda Hayes, won her maiden in an alowance for non-winners under Patrick Husbands. The daughter of Singing Saint out of Askeaton by Tethra was making her 4th career start. CASABLANCA KISS was another 7-year-old mare who was winner on Sayurday. This is another tough gal who is very fast and she won a $60,000 claiming race for Ken Lee, Dennis Mitchell et al for her 2nd win of the year. She is 9 for 39 in her career. On Sunday, M M G Stables’ Undulated rallied last to first under patient handling by Alan Garcia to capture Sunday’s $128,500 Swynford Stakes, a six furlong Tapeta sprint for two-year-olds. Trained by Cathal Lynch, Undulated was last of five at the top of the lane but closed resolutely into too fast splits set by a dueling Katalox and Wellabled to win going away as the 6-1 third choice. The victory marked the second added-money win in as many days for Garcia who took the Sir Barton Stakes on Saturday’s card with Freitag. Katalox, runner-up in the Clarendon Stakes last time out, battled through wild splits of :20.95 and :44 flat with Grade 3 Arlington-Washington Futurity champ Wellabled, while Uncle B tracked their early foot some five lengths back from third position. Sailing Home, the even-money mutuel favourite under Patrick Husbands, settled into fourth just in front of a trailing Undulated. Uncle B, with Emma-Jayne Wilson up, was urged into contention late in the turn and took command outside of the tiring pacesetters as Sailing Home attempted to make up ground along the rail. However, Undulated, many lengths last at the top of the lane, responded with powerful strides when asked by Garcia and charged home a 3/4-length winner. Uncle B held place by 1 1/2-lengths over Sailing Home. Undulated stopped the clock in 1:10.26. By Curlin out of the Foxhound mare Polly Alexander, Undulated was purchased for $625,000 at the March OBS. He graduated at first asking in a grassy maiden allowance tilt at Laurel Park and came up a nose short second time out when sprinting on the turf in the Laurel Futurity. Undulated, bred in Kentucky by Nicholas J. Sibilio, banked $75,000 in his victorious Tapeta debut while improving his record to two wins and a second from three starts. Mr Will Wong captured the first split in the Swynford Stakes for 2-year-olds. The claiming is brisk at Woodbine these days with close to a dozen horses changing hands in the last week. Two more went to new homes after race 1 including the winner MODUS OPERANDI who won for the 3rd time this year for Quintessential racing Florida LLC. The Marchfield 4yo filly was claimed by Alpine Stable for $12,500. Race 3 was a maiden $40,00 claiming race won by RAINBOWS AHEAD, who returned in 7 days to win for Richard Day’s Kingview Farms. Trained by Catherine Day Phillips, the well bred Awesome Again filly out of champion Van Lear Rose stayed clear of a mess of trouble in the race that caused 2 horses to check hard and lose all chance. Interestingly, it was a 5-year-old mare, Katherine’s War, coming off a 3-year layoff, who was briefly in a pace duel but then suddenly dropped out of contentiona dn drifted in, causing Jupiter’s Eagle and Bourbon Babe to check hard and lose all chance. Katherine’s War finished last in the maiden allowance field. She is one of several horses who have come back to racing after two to three, even four year layoffs this fall at Woodbine. The famous blue and white silks of KINGHAVEN FARMS were in the winner’s circle on Sunday when CONFIDENTIALITY won a maiden 2yo allowance race in his 2nd career race. The son of Silent Hame (Jpn) led a 1-2-3 parade across the wire for the sire. Ian Black trains the winner who is out of the tough sprint mare Bent Attorney and Silver Duck and Sedgefield Farm bred the gelding. Stunning performance by TED W in race 6, a $62,500 optional claiming event. This 5yo by Niigon, making his 3rd start off the claimg by Augusto Onesi and trainer Martin Drexler won by 5 lengths in 1:15.08 for 6 1/2 furlongs, posting a career best 100 Beyer Figure. The 5yo is 7 for 20 in his career now and he had previously won for $40,000 claiming in September. With just 4 days of racing left at Woodbine, the championship discussions begin. The Sovereign Awards will not be handed out until April but the voting will be done in the first week of the new year. This year is much like others with many categories being too difficult to predict who has the edge. In fact, this may be the most difficult, and wide open year for selecting champions. Horse of the Year? CAREN will get a lot of support since the 3-year-old was dominant in her category. The Society’s Chairman gal won four straight stakes races during her roll of top form and five stakes overall on Tapeta and turf from distances from 7 furlongs to 10 furlongs. Other than 2 poor runs in the U.S., Caren was indeed a top Canadian Horse in 2016. The MARK CASSE barn has edged past trainer GREG TRACY by Canadian wins following the weekend. Casse has 95 wins at Woodbine while Tracy has 93 at three different Canadian tracks. While a lot of trainers, such as MIKE DEPAULO, have had very big season in 2016, the Sovereign award voting tends to be more of a mechanical process for some who look only at straight numbers – thus Casse will probably win his 6th straight Sovereign Trophy. Voters should certainly give a close look to horses and horsepeople in Alberta, BC and Manitoba this year as many of these categories have no clear-cut horse. 2-year-old filly – from the Natalma to Princess Elizabeth to the Nandi and between, the 2yo filly stakes were won by half a dozen different horses. Sprinter Conquest Vivi won 2 stakes, Cindervella could win 2 stakes should she take tomorrow night’s Ontario Lassie. 2-year-old colt – KING AND HIS COURT own the Coronation, LOKINFORPPURSEMONEE won a few added-money events, restricted, Tiz a Slam won the Cup & Saucer and the deceased Golden Hawk won the Grey. 3-year-old colt – AMIS GIZMO won a graded stake and the Princes of Wales and should be the winner. Older male – BREAKING LUCKY’S 2nd place finish in the Grade 1 Clark to Gun Runner, his close finishin the Grade 1 Woodward and graded win at Woodbine should be enough to get this award with ARE YOU KIDDING ME in the hunt. Older female – SWEATER WEATHER won 2 stakes, MIDNIGHT MILEY, also 2, ICE FESTIVAL and more. Turf female – Caren could win this too. Owners category is wide open with perhaps IVAN DALOS long overdue to get the title. Breeder – Dalos again deserves consideration.